Rustic. What is rustic? The definition of ‘rustic’ is essentially, simplistic and unsophisticated. I guess you are therefore expecting this round up of rustic log cabins to be plain and boring?! Oh how wrong you are! Sometimes; simplicity is much more beautiful than a sprawling building with all the latest modern technologies. Get ready to go on a ten minute vacation exploring back to basic rustic cabins, to much more luxurious log cabins that still manage to maintain a rustic feel! This cabin is set in the alpine valley, nestled deep within the Colorado Rocky Mountains. Best described as a ghost town full of contradictions, this resort offers simplistic hand-hewn log cabins which are finely furnished, amazing quality food served from a life-worn saloon and sensuous hot springs overlooking the icy mountains. The rustic cabins can be rented individually, or the town as a whole to provide for larger occasions. The cabins, each uniquely and beautifully designed, circle a saloon and dance hall. Each cabin possesses its own unique characteristics, but the one thing they all share in common is the magnificent mountain views out of each and every window. Set within the Yellowstone Club of Montana’s famous mountains, is this exquisite log cabin. Although extravagant this log home still has a very rustic feel to it. Designer Erika Jennings was able to incorporate many of the owner’s furnishings that they already owned to create the perfect cosy inviting atmosphere they were aiming for. The interior is very simple yet of an extremely high quality. This cabin is full of rustic charm throughout the open plan space. It is made up of one large living space, with a private master suite and loft space for the children to sleep in. 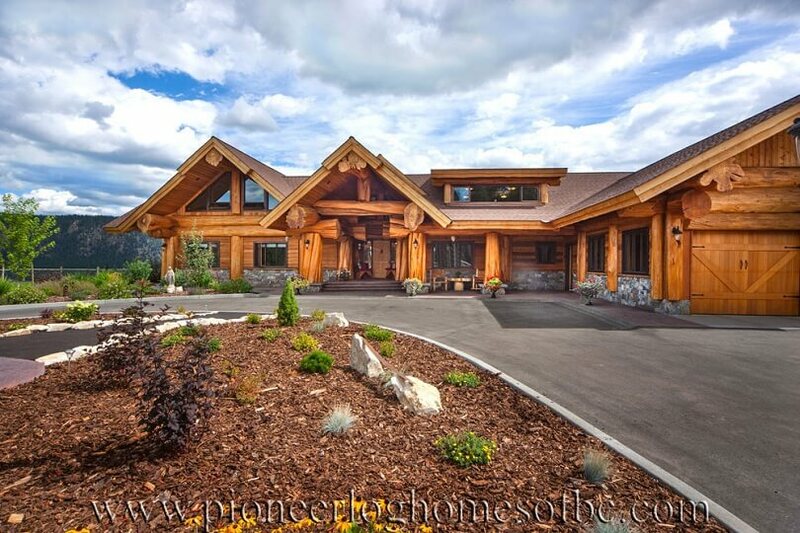 Sat upon a ridge high above Williams Lake, British Columbia, is this very beautiful 5,500 square foot log home. When David and Alyssa Chevigny decided to build their third log home, the design and idea was inspired by creating a space ‘for everyone to be together and feel comfortable’ says Alyssa. The result was a floorplan that offers open living, cooking and dining spaces, with private bedrooms for guests. The log home was also designed to make the most of the beautiful views ‘No matter where you are in the home, the view is stunning,’ Alyssa says. Located in the heart of Paradise Valley near Yellowstone National Park in Montana, the Shooting Star cabin is a spacious cabin with vaulted pine ceiling. The interior is very inviting, and its décor is in keeping with the rustic feel of the cabin, with solid wooden furniture and an open plan living space. There is also a large spa tub in the bathroom to relax and unwind in! 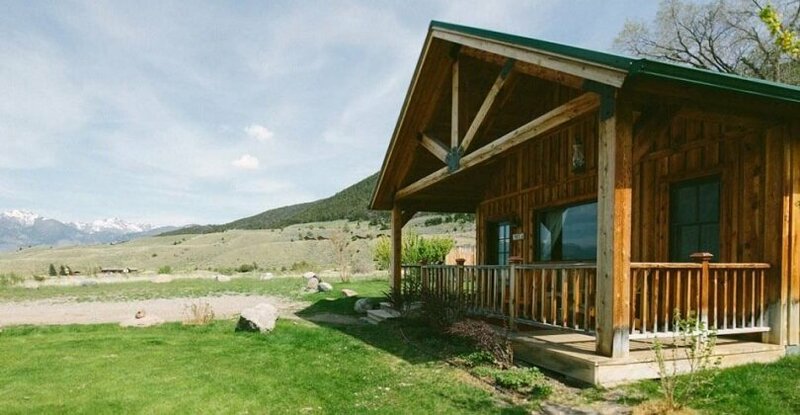 Nestled at the foot of the Absaroka Mountain Range, the cabin has a covered deck area with seating that has views over the amazing surrounding landscape. Tiny Homes have become more and more popular over the last few years. Perhaps it is because they can be taken anywhere in the world, perhaps because of the relatively cheap cost to building a regular home or perhaps because they are a greener option and many are off grid. This 198 square foot cabin has a kitchen and living area, one bedroom and a bathroom and costs $25k. Designed and built by SpiceBox, their vision was to create a functional easy to move home that was affordable and energy-efficient. They used reclaimed materials, a vintage RV stove, reclaimed barn roofing and passive solar-heating with the aim of making their home coexist with the environment. Mountain Spirit is located in Blue Ridge, GA. 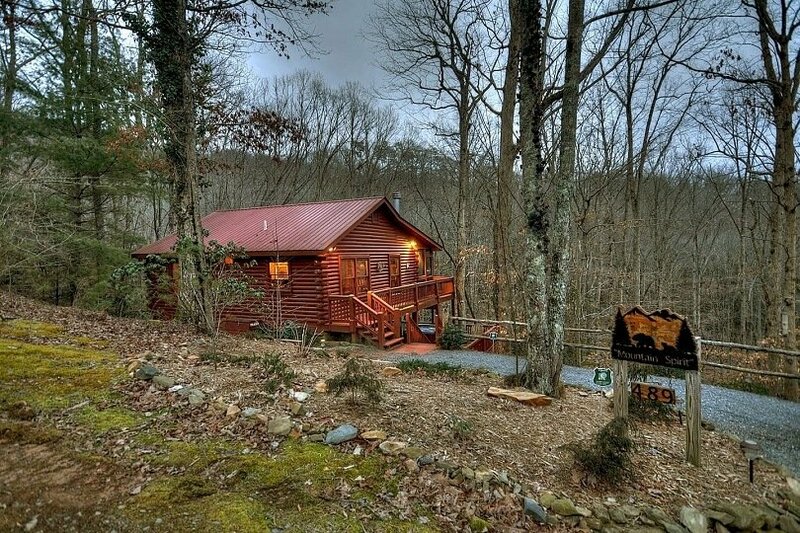 The cabin has a wonderful covered porch area with seating to enjoy the beautiful scenic mountain views. The lower deck is also covered and has another seating area perfect for picnics, and a Jacuzzi. The interior is very tastefully decorated with an open plan kitchen, dining and living space. The two bedrooms both have queen size beds, in keeping with the rustic style, made from logs. Springs Retreat is a two storey cabin, the only building in a 12 acre wooded area, surrounded by woods and wildlife. 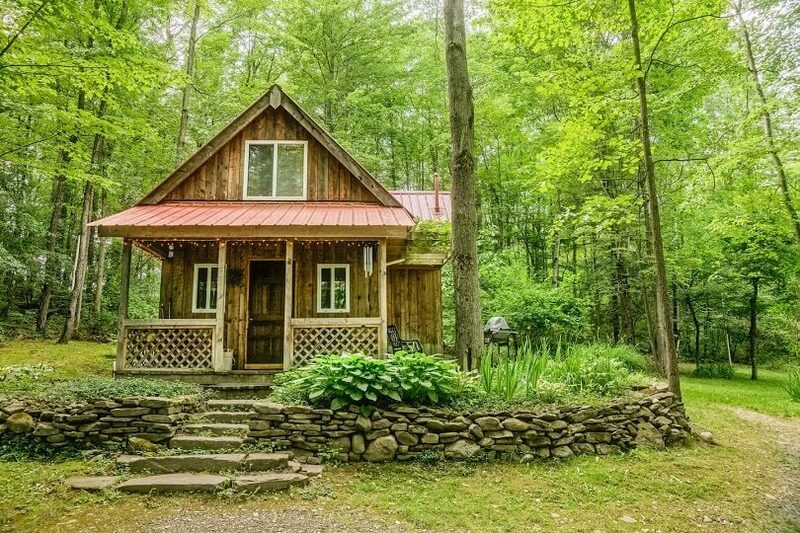 The quaint looking cabin is just as inviting on the inside as it is on the out. Thre is a small open plan living space, which is deocrated in keeping the the rustic charm of the exterior. Up the stairs, there are two bedrooms and unique little details scattered throughout. 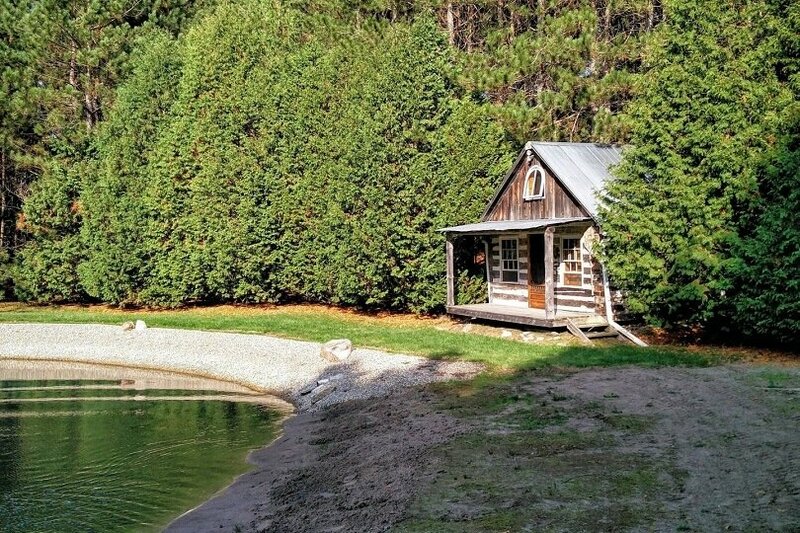 The family built Springs Retreat to use as their first home, and love the simplicity and solitude it offers. Being tucked away from the main roads, the cabin feels like it is in the middle of nowhere, with the added benefit that it is only a few miles from the nearest town. This beautiful labour of love was built by the owners themselves, along with much of the furniture inside. 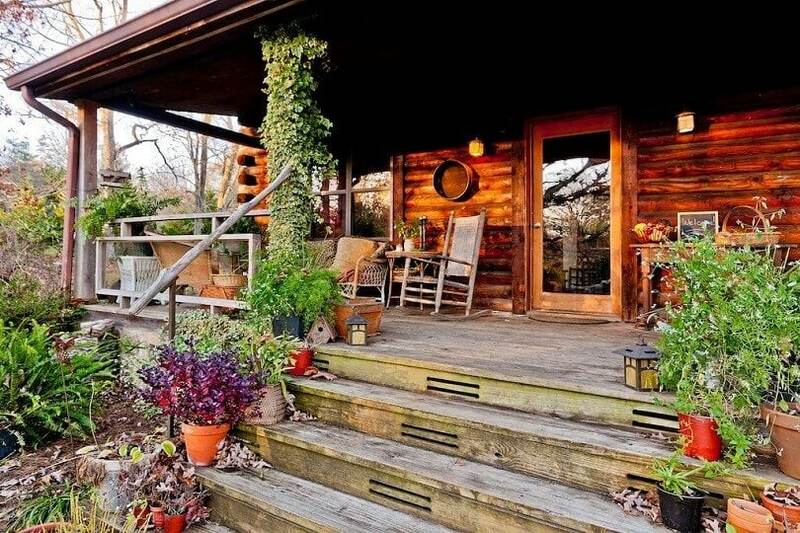 Located on Lookout Mountain, GA, every single detail in the cabin is beautiful. The main log home has a wonderful rich rustic feel throughout, with a large great room which is very cozy and inviting. There is a private suite attached to the cabin with its own entrance, where there is a queen size bed, a bunk bed, small kitchenette area, dining space and bathroom. The many plants and shrubs that surround the cabin certainly add to the rustic feel, the property is overflowing with home grown organic goodies, which the owners utilise to make their meals for their guests. Located in Caledon, ON, Candada, and set on 15 acres of wooded land, with a ½ acre pond, is this cozy log cabin. In the cabin there are two rooms downstairs, the main room which is home to a wood burning stove and living space and the back room with a kitchenette and an ‘airhead’ compost toilet. To reach the sleeping area on the second floor, there is a ladder which takes you into an A framed roof. 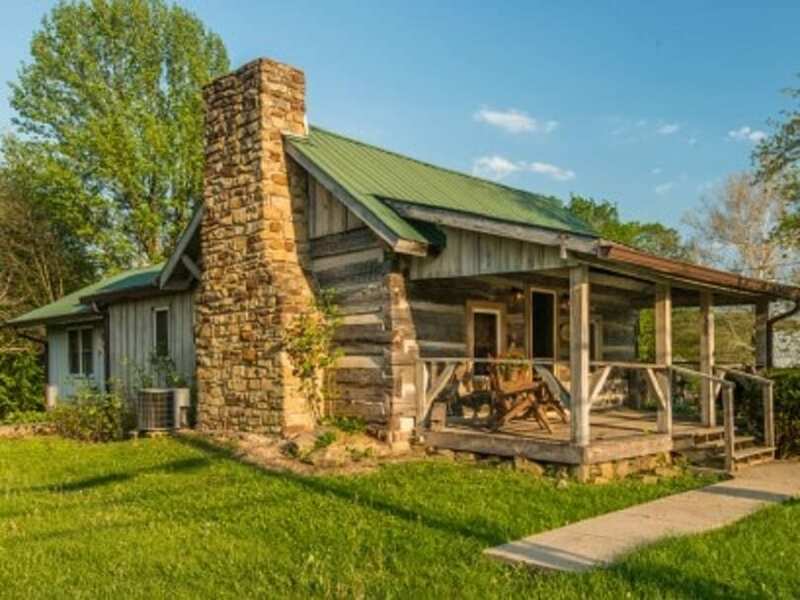 Located in the middle of Bean Blossom, Nashville, Indiana, is this sweet looking one bedroomed log home – A very cozy place to relax in. This cabin fits very well into its surroundings, with a wide stone chimney and a green roof. The square logs with thick chinking, adds a rustic charm to the property, and the outdoor covered porch area provides a perfect space to sit and reflect. The cabin is spread out on one level, with a comfortable lounging space to enjoy the wood burning fire. So there you have it – Our Top Ten Rustic Log Cabins! Our favourite, is a close call between the simple cabin on wheels which would allow you to see the world from the comfort of your own home, and the luxurious cabin in Montana. We hope you enjoyed this roundup, has it made you think about starting a new simplistic, back to nature life? Let us know below.